If you’ve never mastered using a moka pot, don’t know how to steam milk and have developed a codependent relationship with your local barista, this is the class for you. 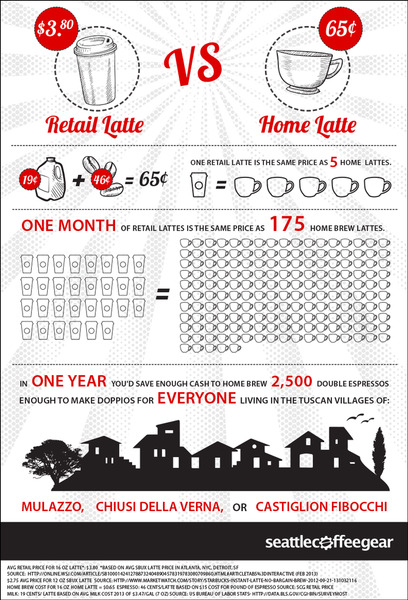 Did you know that DIY lattes and cappuccino at home can save you up to $1149 per year on your coffee addiction? Why are you paying $3.50 for a little drink you could make at home for 50 cents? Europeans consume most of their Specialty coffee at home, but we Americans are addicted to retail lattes. The thing is: if you master the basic techniques of a variety of home brewing styles, you never have to have a bad cup of coffee again (provided you buy your beans from a highly rated local roaster, COUGH COUGH). Espresso is not a bean! They are typically blends that roasters think produce good, balanced flavor under the pressure of espresso machines. That said, there’s a lot of fun to be had experimenting with single origins as espresso. I’d recommend an Ethiopia, to start.